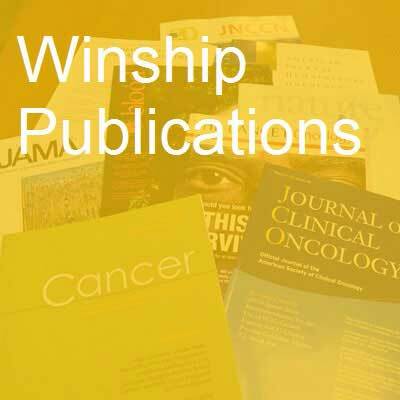 Various first authors and senior authors from Winship Cancer Institute have published 126 studies in major medical and scientific journals in the past month. The heterogeneous impact of a successful tobacco control campaign: a case study of Mauritius. Ross H, Moussa L, Harris T, Ajodhea R. Tobacco control. 2018; 27(1):83-89. PubMed PMID: 28302918. Systematic review of the literature on triclosan and health outcomes in humans. Goodman M, Naiman DQ, LaKind JS. Critical reviews in toxicology. 2018; 48(1):1-51. PubMed PMID: 28741979. Comparison of the toxicity profile of PD-1 versus PD-L1 inhibitors in non-small cell lung cancer: A systematic analysis of the literature. Pillai RN, Behera M, Owonikoko TK, Kamphorst AO, Pakkala S, Belani CP, Khuri FR, Ahmed R, Ramalingam SS. Cancer. 2018; 124(2):271-277. PubMed PMID: 28960263; PubMed Central PMCID: PMC5761314. Capitalizing on Social Media for Career Development. Escoffery C, Kenzig M, Hyden C, Hernandez K. Health promotion practice. 2018; 19(1):11-15. PubMed PMID: 28962538. SPIRIT trial: A phase III pragmatic trial of an advance care planning intervention in ESRD. Song MK, Unruh ML, Manatunga A, Plantinga LC, Lea J, Jhamb M, Kshirsagar AV, Ward SE. Contemporary clinical trials. 2018; 64:188-194. PubMed PMID: 28993286; PubMed Central PMCID: PMC5742022. Correspondence Between Results and Aims of Funding Support in EPIDEMIOLOGY Articles. Lash TL, Kaufman JS, Hernán MA. Epidemiology (Cambridge, Mass.). 2018; 29(1):1-4. PubMed PMID: 29023240. New Designs for New Epidemiology. Lash TL, Schisterman EF. Epidemiology (Cambridge, Mass.). 2018; 29(1):76-77. PubMed PMID: 29068839. Identification of Staphylococcal Quorum Sensing Inhibitors by Quantification of õ-Hemolysin with High Performance Liquid Chromatography. Quave CL, Horswill AR. Methods in molecular biology (Clifton, N.J.). 2018; 1673:363-370. PubMed PMID: 29130186. Editorial Comment. Filson CP. Urology. 2018; 111:84-85. PubMed PMID: 29174272. Hospitalization Costs After Surgery in High-Risk Patients With Early Stage Lung Cancer. Sancheti MS, Chihara RK, Perez SD, Khullar OV, Fernandez FG, Pickens A, Force SD. The Annals of thoracic surgery. 2018; 105(1):263-270. PubMed PMID: 29174780. Meat consumption and pancreatic cancer risk among men and women in the Cancer Prevention Study-II Nutrition Cohort. McCullough ML, Jacobs EJ, Shah R, Campbell PT, Wang Y, Hartman TJ, Gapstur SM. Cancer causes & control : CCC. 2018; 29(1):125-133. PubMed PMID: 29185090. Vitamin D deficiency is associated with an oxidized plasma cysteine redox potential in critically Ill children. Alvarez JA, Grunwell JR, Gillespie SE, Tangpricha V, Hebbar KB. The Journal of steroid biochemistry and molecular biology. 2018; 175:164-169. PubMed PMID: 27641738; PubMed Central PMCID: PMC5352547. An Appreciation of the U.S. Preventive Services Task Force. Brawley OW. American journal of preventive medicine. 2018; 54(1):151-152. PubMed PMID: 29254552. Dietary Energy Density, Glycemic Load, Glycemic Index, and Risk for Endometrial Cancer in the CPS-II Nutrition Cohort. Hartman TJ, McCullough ML, Hodge JM, Gaudet MM, Wang Y, Gapstur SM. Cancer epidemiology, biomarkers & prevention : a publication of the American Association for Cancer Research, cosponsored by the American Society of Preventive Oncology. 2018; 27(1):113-115. PubMed PMID: 29284671. Correlates of Allowing Alternative Tobacco Product or Marijuana Use in the Homes of Young Adults. Berg CJ, Haardörfer R, Wagener TL, Kegler MC, Windle M. Pediatrics. 2018; 141(Suppl 1):S10-S20. PubMed PMID: 29292302. Mucinous and secondary tumors of the prostate. Osunkoya AO. Modern pathology : an official journal of the United States and Canadian Academy of Pathology, Inc. 2018; 31(S1):S80-S95. PubMed PMID: 29297488. Appendiceal Mucinous Neoplasms: Diagnosis and Management. Shaib WL, Assi R, Shamseddine A, Alese OB, Staley 3rd C, Memis B, Adsay V, Bekaii-Saab T, El-Rayes BF. The oncologist. 2018; 23(1):137. PubMed PMID: 29317549. The prospects for combination therapy with capecitabine in the rapidly evolving treatment landscape of renal cell carcinoma. Bilen MA, Carlisle JW, Sonpavde G. Expert opinion on investigational drugs. 2018; :1-8. PubMed PMID: 29323560. Tumor Mutation Burden: Leading Immunotherapy to the Era of Precision Medicine? Steuer CE, Ramalingam SS. Journal of clinical oncology : official journal of the American Society of Clinical Oncology. 2018; :JCO2017768770. PubMed PMID: 29337637. An overview of confounding Part 1: The concept and how to address it. Howards PP. Acta obstetricia et gynecologica Scandinavica. 2018; PubMed PMID: 29341103. An overview of confounding Part 2: How to identify it and special situations. Howards PP. Acta obstetricia et gynecologica Scandinavica. 2018; PubMed PMID: 29341101. A scoping study of frameworks for adapting public health evidence-based interventions. Escoffery C, Lebow-Skelley E, Udelson H, Böing EA, Wood R, Fernandez ME, Mullen PD. Translational behavioral medicine. 2018; PubMed PMID: 29346635. ABP 980: promising trastuzumab biosimilar for HER2-positive breast cancer. Paplomata E, Nahta R. Expert opinion on biological therapy. 2018; :1-7. PubMed PMID: 29350568. Ruxolitinib: a steroid sparing agent in chronic graft-versus-host disease. Khoury HJ, Langston AA, Kota VK, Wilkinson JA, Pusic I, Jillella A, Bauer S, Kim AS, Roberts D, Al-Kadhimi Z, Bodo I, Winton E, Arellano M, DiPersio JF. Bone marrow transplantation. 2018; PubMed PMID: 29367708. RNA-Peptide nanoplexes drug DNA damage pathways in high-grade serous ovarian tumors. Dreaden EC, Kong YW, Quadir MA, Correa S, Suárez-López L, Barberio AE, Hwang MK, Shi AC, Oberlton B, Gallagher PN, Shopsowitz KE, Elias KM, Yaffe MB, Hammond PT. Bioengineering & translational medicine. 2018; 3(1):26-36. PubMed PMID: 29376131; PubMed Central PMCID: PMC5773954. Dietary assessment in the digital age: the ongoing quest for better methods. McCullough ML. The American journal of clinical nutrition. 2018; 107(1):1-2. PubMed PMID: 29381804. Translation research to apply genomics to improve health promotion: Is it worth the investment? McBride CM. Translational behavioral medicine. 2018; 8(1):54-58. PubMed PMID: 29385586. Commentary on: Enhanced Recovery After Surgery: The Plastic Surgery Paradigm Shift. Sullivan PS. Aesthetic surgery journal. 2018; PubMed PMID: 29394322. One-Year Linear Trajectories of Symptoms, Physical Functioning, Cognitive Functioning, Emotional Well-being, and Spiritual Well-being Among Patients Receiving Dialysis. Song MK, Paul S, Ward SE, Gilet CA, Hladik GA. American journal of kidney diseases : the official journal of the National Kidney Foundation. 2018; PubMed PMID: 29395483. Development of chimeric antigen receptors targeting T-cell malignancies using two structurally different anti-CD5 antigen binding domains in NK and CRISPR-edited T cell lines. Raikar SS, Fleischer LC, Moot R, Fedanov A, Paik NY, Knight KA, Doering CB, Spencer HT. Oncoimmunology. 2018; 7(3):e1407898. PubMed PMID: 29399409; PubMed Central PMCID: PMC5790337. Association Between Pretreatment Neutrophil-to-Lymphocyte Ratio and Outcome of Patients With Metastatic Renal-Cell Carcinoma Treated With Nivolumab. Bilen MA, Dutcher GMA, Liu Y, Ravindranathan D, Kissick HT, Carthon BC, Kucuk O, Harris WB, Master VA. Clinical genitourinary cancer. 2018; PubMed PMID: 29402706. The Use of a Novel Immunohistochemical Triple Cocktail in the Subclassification of Resected Non-Small Cell Lung Carcinomas: A Comparative Study With Morphology and Traditional Immunohistochemistry. HooKim K, Chaudoir CS, Chaudhery SI, Reid MD. Applied immunohistochemistry & molecular morphology : AIMM. 2018; 26(1):27-34. PubMed PMID: 27258567. Weight-Related Perceptions and Experiences of Young Adult Women in Southwest Georgia. Woodruff RC, Raskind IG, Ballard D, Battle G, Haardörfer R, Kegler MC. Health promotion practice. 2018; 19(1):125-133. PubMed PMID: 28132532. Toward Hydrogen Sulfide Based Therapeutics: Critical Drug Delivery and Developability Issues. Zheng Y, Yu B, De La Cruz LK, Roy Choudhury M, Anifowose A, Wang B. Medicinal research reviews. 2018; 38(1):57-100. PubMed PMID: 28240384. Regression of diffuse B-cell lymphoma of the leg with intralesional gentian violet. Rao S, Morris R, Rice ZP, Arbiser JL. Experimental dermatology. 2018; 27(1):93-95. PubMed PMID: 28833549. Obesity, physical activity, and breast cancer survival among older breast cancer survivors in the Cancer Prevention Study-II Nutrition Cohort. Maliniak ML, Patel AV, McCullough ML, Campbell PT, Leach CR, Gapstur SM, Gaudet MM. Breast cancer research and treatment. 2018; 167(1):133-145. PubMed PMID: 28856470. The Expanded Use of Autoaugmentation Techniques in Oncoplastic Breast Surgery. Losken A, Hart AM, Dutton JW, Broecker JS, Styblo TM, Carlson GW. Plastic and reconstructive surgery. 2018; 141(1):10-19. PubMed PMID: 28915209. An intensive modular dermatology curriculum for family medicine residents in a resource-limited setting. McMichael JR, Thompson KB, Kent SC, Stoff BK. International journal of dermatology. 2018; 57(1):119-120. PubMed PMID: 28960279. Walking in Relation to Mortality in a Large Prospective Cohort of Older U.S. Adults. Patel AV, Hildebrand JS, Leach CR, Campbell PT, Doyle C, Shuval K, Wang Y, Gapstur SM. American journal of preventive medicine. 2018; 54(1):10-19. PubMed PMID: 29056372. A Novel Application of Structural Equation Modeling Estimates the Association between Oxidative Stress and Colorectal Adenoma. Eldridge RC, Goodman M, Bostick RM, Fedirko V, Gross M, Thyagarajan B, Flanders WD. Cancer prevention research (Philadelphia, Pa.). 2018; 11(1):52-58. PubMed PMID: 29074536. Redefining the Ki-67 Index Stratification for Low-Grade Pancreatic Neuroendocrine Tumors: Improving Its Prognostic Value for Recurrence of Disease. Lopez-Aguiar AG, Ethun CG, Postlewait LM, Zhelnin K, Krasinskas A, El-Rayes BF, Russell MC, Sarmiento JM, Kooby DA, Staley CA, Maithel SK, Cardona K. Annals of surgical oncology. 2018; 25(1):290-298. PubMed PMID: 29079920. Ultrasound Imaging Technologies for Breast Cancer Detection and Management: A Review. Guo R, Lu G, Qin B, Fei B. Ultrasound in medicine & biology. 2018; 44(1):37-70. PubMed PMID: 29107353. Dual-targeting Wnt and uPA receptors using peptide conjugated ultra-small nanoparticle drug carriers inhibited cancer stem-cell phenotype in chemo-resistant breast cancer. Miller-Kleinhenz J, Guo X, Qian W, Zhou H, Bozeman EN, Zhu L, Ji X, Wang YA, Styblo T, O'Regan R, Mao H, Yang L. Biomaterials. 2018; 152:47-62. PubMed PMID: 29107218. Organic CO Prodrugs Activated by Endogenous ROS. Pan Z, Zhang J, Ji K, Chittavong V, Ji X, Wang B. Organic letters. 2018; 20(1):8-11. PubMed PMID: 29111756. Targeted Therapies: Immunologic Effects and Potential Applications Outside of Cancer. Kersh AE, Ng S, Chang YM, Sasaki M, Thomas SN, Kissick HT, Lesinski GB, Kudchadkar RR, Waller EK, Pollack BP. Journal of clinical pharmacology. 2018; 58(1):7-24. PubMed PMID: 29136276. A Resource for the Allele-Specific Analysis of DNA Methylation at Multiple Genomically Imprinted Loci in Mice. Wasson JA, Birol O, Katz DJ. G3 (Bethesda, Md.). 2018; 8(1):91-103. PubMed PMID: 29138238; PubMed Central PMCID: PMC5765370. Analysis of Copy Number Variants on Chromosome 21 in Down Syndrome-Associated Congenital Heart Defects. Rambo-Martin BL, Mulle JG, Cutler DJ, Bean LJH, Rosser TC, Dooley KJ, Cua C, Capone G, Maslen CL, Reeves RH, Sherman SL, Zwick ME. G3 (Bethesda, Md.). 2018; 8(1):105-111. PubMed PMID: 29141989; PubMed Central PMCID: PMC5765339. HDAC inhibitor suppresses proliferation and invasion of breast cancer cells through regulation of miR-200c targeting CRKL. Bian X, Liang Z, Feng A, Salgado E, Shim H. Biochemical pharmacology. 2018; 147:30-37. PubMed PMID: 29155146; PubMed Central PMCID: PMC5733635. Osimertinib in Untreated EGFR-Mutated Advanced Non-Small-Cell Lung Cancer. Soria JC, Boyer M, Ohe Y, Lee C, Vansteenkiste J, Hughes B, Reungwetwattana T, O’Byrne K, Chewaskulyong B, Briggs P, Lee KH, Milward M, Dechaphunkul A, John T, Imamura F, Demedts I, Nogami N, Bustin F, Kurata T, Barrios CH, Okamoto I, Timcheva C, Zhou C, Butts C, Cho BC, Goss G, Cheng Y, Juergens R, Cho EK, Leighl N, Voon PJ, Cheng S, Planchard D, Burkes R, Su WC, Zhang H, Gray JE, Shu Y, Lee SM, Zhou Q, Hodge R, Li W, Marotti M, Feng G, Rukazenkov Y, He Y, Ramalingam SS, Wang B, , Gao H, Nan K, Zhou X, Fan Y, Hunag JA, Hu Y, Liu YP, Liu C, Zhang Y, Zhu B, Bartek T, Monnet I, El Kouri C, Perol M, Berard H, Madelaine J, von Pawel J, Grohe C, Bohnet S, Bischoff H, zum Büschenfelde CM, Rückert A, Urban L, Papi-Szekely Z, Csánky E, Böcskei C, Tehenes S, Gottfried M, Bar J, Peled N, Wollner M, Bertolini A, Ardizzoia A, Accettura C, Mitella M, Passalacqua R, Novello S, Roila F, Tiseo M, Sekine A, Takahashi T, Kasahara K, Yoh K, Sugawara S, Kobayashi N, Shimokawa T, Okuda C, Fukuhara T, Sata M, Nagakawa K, Atagi S, Nakahara Y, Lee JS, Lee KY, Shin SW, Kang JH, How SH, Pang YK, Osorio-Sanchez JA, Ladrera GEI, Serwatowski P, Szczesna A, Zajda K, Ramlau R, Sawka D, Encarnação Teixeira M, Almodovar T, Soares M, Almeida A, Barroso A, Schenker M, Girgorescu AC, Iorga P, Orlov S, Karaseva N, Moiseenko V, Garcia Campelo R, Isla Casado MD, Cobo Dols M, Nadal E, Campayo Guillaumes M, González Larriba JL, Majem Tarruella M, Vázquez Estévez S, Fuentes Pradera J, Márquez Medina D, Vikstrom A, Gautschi O, Britschgi C, Mueller A, Tsai YH, Wu MF, Yang CT, Lin MC, Chen CH, Srimuninnimit V, Laohavinij S, Sriuranpong V, Yildiz R, Bondarenko I, Vynnychenko I, Adamchuk H, Shparyk Y, Price A, Summers Y, Shah R, Dragnev K, Maniam A, McCune S, Ruiz J, Jänne P, Feinstein T, Hamm J, Anderson I, Khan F, Boccia R, Tran N, Nguyen N. The New England journal of medicine. 2018; 378(2):113-125. PubMed PMID: 29151359. Statins and cancer survivors: the need for structured guidelines. Almuwaqqat Z, Hung O, Parashar S. Future cardiology. 2018; 14(1):5-8. PubMed PMID: 29168650. Increased activity of both CDK1 and CDK2 is necessary for the combinatorial activity of WEE1 inhibition and cytarabine. Garcia TB, Fosmire SP, Porter CC. Leukemia research. 2018; 64:30-33. PubMed PMID: 29175378. Prediction of Long-Term Survival After Lung Cancer Surgery for Elderly Patients in The Society of Thoracic Surgeons General Thoracic Surgery Database. Onaitis MW, Furnary AP, Kosinski AS, Kim S, Boffa D, Tong BC, Cowper P, Jacobs JP, Wright CD, Putnam Jr JB, Fernandez FG. The Annals of thoracic surgery. 2018; 105(1):309-316. PubMed PMID: 29174391. A proteomic network approach across the ALS-FTD disease spectrum resolves clinical phenotypes and genetic vulnerability in human brain. Umoh ME, Dammer EB, Dai J, Duong DM, Lah JJ, Levey AI, Gearing M, Glass JD, Seyfried NT. EMBO molecular medicine. 2018; 10(1):48-62. PubMed PMID: 29191947; PubMed Central PMCID: PMC5760858. p38 MAPK inhibits autophagy and promotes microglial inflammatory responses by phosphorylating ULK1. He Y, She H, Zhang T, Xu H, Cheng L, Yepes M, Zhao Y, Mao Z. The Journal of cell biology. 2018; 217(1):315-328. PubMed PMID: 29196462; PubMed Central PMCID: PMC5748971. Immune checkpoint inhibitors in advanced non-small cell lung cancer. Assi HI, Kamphorst AO, Moukalled NM, Ramalingam SS. Cancer. 2018; 124(2):248-261. PubMed PMID: 29211297. Evaluating the Efficacy of GLUT Inhibitors Using a Seahorse Extracellular Flux Analyzer. Wei C, Heitmeier M, Hruz PW, Shanmugam M. Methods in molecular biology (Clifton, N.J.). 2018; 1713:69-75. PubMed PMID: 29218518. Toward Direct Protein S-Persulfidation: A Prodrug Approach That Directly Delivers Hydrogen Persulfide. Yu B, Zheng Y, Yuan Z, Li S, Zhu H, De La Cruz LK, Zhang J, Ji K, Wang S, Wang B. Journal of the American Chemical Society. 2018; 140(1):30-33. PubMed PMID: 29211467. Targeting Mcl-1 enhances DNA replication stress sensitivity to cancer therapy. Chen G, Magis AT, Xu K, Park D, Yu DS, Owonikoko TK, Sica GL, Satola SW, Ramalingam SS, Curran WJ, Doetsch PW, Deng X. The Journal of clinical investigation. 2018; 128(1):500-516. PubMed PMID: 29227281. SLC9B1 methylation predicts fetal intolerance of labor. Knight AK, Conneely KN, Kilaru V, Cobb D, Payne JL, Meilman S, Corwin EJ, Kaminsky ZA, Dunlop AL, Smith AK. Epigenetics. 2018; :1-7. PubMed PMID: 29235940.
. Garcia RM, Hanlon A, Small W, Strauss JB, Lin L, Wells J, Bruner DW. Oncology nursing forum. 2018; 45(1):25-32. PubMed PMID: 29251291. The PLAG1-GDH1 Axis Promotes Anoikis Resistance and Tumor Metastasis through CamKK2-AMPK Signaling in LKB1-Deficient Lung Cancer. Jin L, Chun J, Pan C, Kumar A, Zhang G, Ha Y, Li D, Alesi GN, Kang Y, Zhou L, Yu WM, Magliocca KR, Khuri FR, Qu CK, Metallo C, Owonikoko TK, Kang S. Molecular cell. 2018; 69(1):87-99.e7. PubMed PMID: 29249655; PubMed Central PMCID: PMC5777230. Site-Selective RNA Splicing Nanozyme: DNAzyme and RtcB Conjugates on a Gold Nanoparticle. Petree JR, Yehl K, Galior K, Glazier R, Deal B, Salaita K. ACS chemical biology. 2018; 13(1):215-224. PubMed PMID: 29155548. Catalytic Defluoroalkylation of Trifluoromethylaromatics with Unactivated Alkenes. Wang H, Jui NT. Journal of the American Chemical Society. 2018; 140(1):163-166. PubMed PMID: 29256607. Platelet integrins exhibit anisotropic mechanosensing and harness piconewton forces to mediate platelet aggregation. Zhang Y, Qiu Y, Blanchard AT, Chang Y, Brockman JM, Ma VP, Lam WA, Salaita K. Proceedings of the National Academy of Sciences of the United States of America. 2018; 115(2):325-330. PubMed PMID: 29269394; PubMed Central PMCID: PMC5777034. Structural and Dynamics Comparison of Thermostability in Ancient, Modern, and Consensus Elongation Factor Tus. Okafor CD, Pathak MC, Fagan CE, Bauer NC, Cole MF, Gaucher EA, Ortlund EA. Structure (London, England : 1993). 2018; 26(1):118-129.e3. PubMed PMID: 29276038; PubMed Central PMCID: PMC5785943. The prodrug of 7,8-dihydroxyflavone development and therapeutic efficacy for treating Alzheimer's disease. Chen C, Wang Z, Zhang Z, Liu X, Kang SS, Zhang Y, Ye K. Proceedings of the National Academy of Sciences of the United States of America. 2018; 115(3):578-583. PubMed PMID: 29295929; PubMed Central PMCID: PMC5777001. Scrutiny-Dependent Cancer and Self-fulfilling Risk Factors. Welch HG, Brawley OW. Annals of internal medicine. 2018; 168(2):143-144. PubMed PMID: 29297002. Racial and Ethnic Disparities in Interval Colorectal Cancer Incidence. Fedewa SA, Flanders WD, Jemal A, Doubeni CA, Goodman M. Annals of internal medicine. 2018; 168(1):80. PubMed PMID: 29297032. Interactions between Enteric Bacteria and Eukaryotic Viruses Impact the Outcome of Infection. Berger AK, Mainou BA. Viruses. 2018; 10(1). PubMed PMID: 29301335. Comparative outcomes and toxicities for ruthenium-106 versus palladium-103 in the treatment of choroidal melanoma. Danish H, Ferris MJ, Balagamwala E, Switchenko JM, Patel KR, Choudhary M, Craven C, Mendoza P, Suh J, Bergstrom C, Grossniklaus HE, Aaberg Sr TM, Singh A, Crocker IR, Khan MK. Melanoma research. 2018; PubMed PMID: 29303890. Optic nerve head edema among patients presenting to the emergency department. Sachdeva V, Vasseneix C, Hage R, Bidot S, Clough LC, Wright DW, Newman NJ, Biousse V, Bruce BB. Neurology. 2018; PubMed PMID: 29305439. Adoptive transfer of IL-10+ regulatory B cells decreases myeloid-derived macrophages in the central nervous system in a transgenic amyotrophic lateral sclerosis model. Pennati A, Asress S, Glass JD, Galipeau J. Cellular & molecular immunology. 2018; PubMed PMID: 29307886. Peri-Transplant RBC Transfusion is Associated with Increased Risk of GvHD after Allogeneic Stem Cell Transplantation. Hosoba S, Waller EK, Shenvi N, Graiser M, Easley KA, Al-Kadhimi Z, Andoh A, Antun AG, Barclay S, Josephson CD, Koff JL, Khoury HJ, Langston AA, Zimring JC, Roback JD, Giver CR. Biology of blood and marrow transplantation : journal of the American Society for Blood and Marrow Transplantation. 2018; PubMed PMID: 29307717. Incidence, Survival, and Predictors of Lymph Node Involvement in Early-Stage Gastric Signet Ring Cell Carcinoma in the US. Pokala SK, Zhang C, Chen Z, Gamboa AM, Cristofaro SL, Keilin SA, Cai Q, Willingham FF. Journal of gastrointestinal surgery : official journal of the Society for Surgery of the Alimentary Tract. 2018; PubMed PMID: 29313289. The Paris system for reporting urinary cytology improves correlation with surgical pathology biopsy diagnoses of the lower urinary tract. Bertsch EC, Siddiqui MT, Ellis CL. Diagnostic cytopathology. 2018; PubMed PMID: 29316304. Health care disparities among octogenarians and nonagenarians with stage III lung cancer. Cassidy RJ, Zhang X, Switchenko JM, Patel PR, Shelton JW, Tian S, Nanda RH, Steuer CE, Pillai RN, Owonikoko TK, Ramalingam SS, Fernandez FG, Force SD, Gillespie TW, Curran WJ, Higgins KA. Cancer. 2018; PubMed PMID: 29315497. Strategies to target the Hedgehog signaling pathway for cancer therapy. Xin M, Ji X, De La Cruz LK, Thareja S, Wang B. Medicinal research reviews. 2018; PubMed PMID: 29315702. Orthopedia homeobox is preferentially expressed in typical carcinoids of the lung. Hanley KZ, Dureau ZJ, Cohen C, Shin DM, Owonikoko TK, Sica GL. Cancer. 2018; PubMed PMID: 29316326. Interested in global health? Here is where to start: a checklist for United States dermatology residents. McMichael J, Norton SA, Stoff BK. International journal of dermatology. 2018; PubMed PMID: 29318601. Mitochondrial Network Responses in Oxidative Physiology and Disease. Go YM, Fernandes J, Hu X, Uppal K, Jones DP. Free radical biology & medicine. 2018; PubMed PMID: 29317273. Selective CD28 blockade attenuates CTLA-4-dependent CD8+ memory T cell effector function and prolongs graft survival. Liu D, Badell IR, Ford ML. JCI insight. 2018; 3(1). PubMed PMID: 29321374. Aerobic, Diselenide-Catalyzed Redox Dehydration: Amides and Peptides. Akondi SM, Gangireddy P, Pickel TC, Liebeskind LS. Organic letters. 2018; PubMed PMID: 29323920. Associations of mitochondrial polymorphisms with sporadic colorectal adenoma. Thyagarajan B, Guan W, Fedirko V, Barcelo H, Ramasubramaian R, Gross M, Goodman M, Bostick RM. Molecular carcinogenesis. 2018; PubMed PMID: 29323753. Chemotherapy with or Without Definitive Radiation Therapy in Inoperable Pancreatic Cancer. Zhong J, Switchenko J, Behera M, Kooby D, Maithel SK, McDonald MW, Lin JY, Cassidy RJ, El-Rayes B, Landry J, Patel PR. Annals of surgical oncology. 2018; PubMed PMID: 29327180. Agonist-induced CXCR4 and CB2 Heterodimerization Inhibits Gα13/RhoA-mediated Migration. Scarlett KA, White EZ, Coke CJ, Carter JR, Bryant LK, Hinton CV. Molecular cancer research : MCR. 2018; PubMed PMID: 29330286. Isolated Central Nervous System Chloroma as a Presenting Sign of Relapsed Pediatric Acute Lymphoblastic Leukemia. Heath JL, Aumann WK, Maxfield CM, Wechsler DS. Journal of pediatric hematology/oncology. 2018; PubMed PMID: 29334537. Pre-existing malignancy results in increased prevalence of distinct populations of CD4+ T cells during sepsis. Xie J, Robertson JM, Chen CW, Zhang W, Coopersmith CM, Ford ML. PloS one. 2018; 13(1):e0191065. PubMed PMID: 29338031. Comparing Cortical Trajectory Transforaminal Lumbar Interbody Fusions Against Pedicle Trajectory Transforaminal Lumbar Interbody Fusions and Posterolateral Fusions: A Retrospective Cohort Study of 90-day Outcomes. Malcolm JG, Moore MK, Choksh FH, Ahmad FU, Refai D. Neurosurgery. 2018; PubMed PMID: 29346684. An Intervention to Improve Physical Function and Caregiver Perceptions in Family Caregivers of Persons With Heart Failure. Gary R, Dunbar SB, Higgins M, Butts B, Corwin E, Hepburn K, Butler J, Miller AH. Journal of applied gerontology : the official journal of the Southern Gerontological Society. 2018; :733464817746757. PubMed PMID: 29347863. Synthesis and SAR of 1,2,3,4-Tetrahydroisoquinoline-Based CXCR4 Antagonists. Wilson RJ, Jecs E, Miller EJ, Nguyen HH, Tahirovic YA, Truax VM, Kim MB, Kuo KM, Wang T, Sum CS, Cvijic ME, Paiva AA, Schroeder GM, Wilson LJ, Liotta DC. ACS medicinal chemistry letters. 2018; 9(1):17-22. PubMed PMID: 29348805; PubMed Central PMCID: PMC5767887. Patterns of Internet-based health information seeking in adult survivors of childhood cancer. Claridy MD, Hudson MM, Caplan L, Mitby PA, Leisenring W, Smith SA, Robison LL, Mertens AC. Pediatric blood & cancer. 2018; PubMed PMID: 29350454. S-nitrosated poly(propylene sulfide) nanoparticles for enhanced nitric oxide delivery to lymphatic tissues. Schudel A, Sestito LF, Thomas SN. Journal of biomedical materials research. Part A. 2018; PubMed PMID: 29352735. Targeting Virulence in Staphylococcus aureus by Chemical Inhibition of the Accessory Gene Regulator System In Vivo. Salam AM, Quave CL. mSphere. 2018; 3(1). PubMed PMID: 29359191; PubMed Central PMCID: PMC5770542. Intensity of Care at the End of Life Among Older Adults in Korea. Kim SH, Kang S, Song MK. Journal of palliative care. 2018; :825859718754398. PubMed PMID: 29361883. Application of Strict Criteria for Noninvasive Follicular Thyroid Neoplasm with Papillary-Like Nuclear Features and Encapsulated Follicular Variant Papillary Thyroid Carcinoma: a Retrospective Study of 50 Tumors Previously Diagnosed as Follicular Variant PTC. du Jour KP, Schmitt AC, Chen AY, Griffith CC. Endocrine pathology. 2018; PubMed PMID: 29368294. The Effects of Fatigue From Overnight Shifts on Radiology Search Patterns and Diagnostic Performance. Hanna TN, Zygmont ME, Peterson R, Theriot D, Shekhani H, Johnson JO, Krupinski EA. Journal of the American College of Radiology : JACR. 2018; PubMed PMID: 29366599. Cadmium-Associated Differential Methylation throughout the Placental Genome: Epigenome-Wide Association Study of Two U.S. Birth Cohorts. Everson TM, Punshon T, Jackson BP, Hao K, Lambertini L, Chen J, Karagas MR, Marsit CJ. Environmental health perspectives. 2018; 126(1):017010. PubMed PMID: 29373860. Epigenetic mechanisms in the placenta related to infant neurodevelopment. Lester BM, Marsit CJ. Epigenomics. 2018; PubMed PMID: 29381081. Click, Release, and Fluoresce: A Chemical Strategy for a Cascade Prodrug System for Codelivery of Carbon Monoxide, a Drug Payload, and a Fluorescent Reporter. De La Cruz LKC, Benoit SL, Pan Z, Yu B, Maier RJ, Ji X, Wang B. Organic letters. 2018; PubMed PMID: 29380605. Inflammatory demyelinating polyneuropathy versus leptomeningeal disease following Ipilimumab. Cafuir L, Lawson D, Desai N, Kesner V, Voloschin A. Journal for immunotherapy of cancer. 2018; 6(1):11. PubMed PMID: 29382383. A single surgeon's experience transitioning to robotic-assisted right colectomy with intracorporeal anastomosis. Reitz ACW, Lin E, Rosen SA. Surgical endoscopy. 2018; PubMed PMID: 29380065. Discovery of Tetrahydroisoquinoline-Containing CXCR4 Antagonists with Improved in Vitro ADMET Properties. Miller EJ, Jecs E, Truax VM, Katzman BM, Tahirovic YA, Wilson RJ, Kuo KM, Kim MB, Nguyen HH, Saindane MT, Zhao H, Wang T, Sum CS, Cvijic ME, Schroeder GM, Wilson LJ, Liotta DC. Journal of medicinal chemistry. 2018; PubMed PMID: 29350534. The effect of itraconazole and rifampicin on the pharmacokinetics of osimertinib. Vishwanathan K, Dickinson PA, So K, Thomas K, Chen YM, De Castro Carpeño J, Dingemans AC, Kim HR, Kim JH, Krebs MG, Yang JC, Bui K, Weilert D, Harvey RD. British journal of clinical pharmacology. 2018; PubMed PMID: 29381826. Medical Decision-Making for Adults Who Lack Decision-Making Capacity and a Surrogate: State of the Science. Kim H, Song MK. The American journal of hospice & palliative care. 2018; :1049909118755647. PubMed PMID: 29390870. Broad Consent for Research on Biospecimens: The Views of Actual Donors at Four U.S. Medical Centers. Warner TD, Weil CJ, Andry C, Degenholtz HB, Parker L, Carithers LJ, Feige M, Wendler D, Pentz RD. Journal of empirical research on human research ethics : JERHRE. 2018; :1556264617751204. PubMed PMID: 29390947. Ultrasonic histogram assessment of early response to concurrent chemo-radiotherapy in patients with locally advanced cervical cancer: a feasibility study. Xu Y, Ru T, Liu B, Wang H, Zhu L, He J, Liu S, Zhou Z, Yang X. Clinical imaging. 2018; 49:144-149. PubMed PMID: 29414509. CD8 T Cell Exhaustion in Chronic Infection and Cancer: Opportunities for Interventions. Hashimoto M, Kamphorst AO, Im SJ, Kissick HT, Pillai RN, Ramalingam SS, Araki K, Ahmed R. Annual review of medicine. 2018; 69:301-318. PubMed PMID: 29414259.
shinyGISPA: A web application for characterizing phenotype by gene sets using multiple omics data combinations. Dwivedi B, Kowalski J. PloS one. 2018; 13(2):e0192563. PubMed PMID: 29415010.